बरिष्ठ फुटबल क्लबमे उपस्थिति आ खेलैत काल कएल गेल गोल (गोलके घरेलु लिगमे कएल गेल गनल जाइत) नवीनतम जानकारी १६ अक्टुबर २०१६. ↑ "Clash of the Titans". Manchester Evening News. 18 April 2010. http://www.manchestereveningnews.co.uk/sport/football/football-news/clash-of-the-titans-989542. अन्तिम पहुँच तिथि: 30 August 2014. ↑ "Famous players featured in U17 c'ships". uefau17.com. Archived from the original on 2 June 2009. https://web.archive.org/web/20090602071706/http://www.uefau17.com/history/index.htm. ↑ "Cristiano Ronaldo Profile at world cup soccer". wldcup.com. http://www.wldcup.com/euro/2004/players_present/472_cristiano_ronaldo_dos_santos_aveiros.html. ↑ Marshall, Adam (12 August 2003). "United confirm Ronaldo capture". Sky Sports. 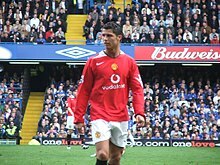 http://www1.skysports.com/football/news/11667/2273339/united-confirm-ronaldo-capture. अन्तिम पहुँच तिथि: 27 August 2014. ↑ "United land other Ronaldo". The Guardian (London). 12 August 2003. https://www.theguardian.com/football/2003/aug/12/newsstory.sportinglisbon. अन्तिम पहुँच तिथि: 27 August 2014. ↑ "Man Utd sign Ronaldo". BBC Sport. 12 August 2003. http://news.bbc.co.uk/sport1/hi/football/teams/m/man_utd/3142959.stm. अन्तिम पहुँच तिथि: 27 August 2014. ↑ Wallace, Sam (13 August 2003). "United fork out record £12m fee to land teenager". The Daily Telegraph. ↑ Taylor, Daniel (13 August 2003). "Teenager takes Beckham No7 shirt". The Guardian (London). https://www.theguardian.com/football/2003/aug/13/newsstory.sport10. अन्तिम पहुँच तिथि: 27 August 2014. ↑ १३.० १३.१ McDonnell, David (29 September 2007). "Cristiano Ronaldo exclusive". Daily Mirror (London). http://www.mirror.co.uk/sport/football/cristiano-ronaldo-exclusive-716711. अन्तिम पहुँच तिथि: 27 August 2014. ↑ Livie, Alex (27 March 2004). "Ronaldo out to impress". Sky Sports. http://www1.skysports.com/football/news/11667/2294783/ronaldo-out-to-impress. अन्तिम पहुँच तिथि: 27 August 2014. ↑ "Ronaldo vows to justify price tag". BBC Sport. 4 July 2009. http://news.bbc.co.uk/sport1/hi/football/teams/m/man_utd/8134301.stm. अन्तिम पहुँच तिथि: 4 July 2009. ↑ १६.० १६.१ Barnes, Justin (12 June 2014). "George Best On Ronaldo's Debut For Man Utd". Sabotage Times. http://sabotagetimes.com/reportage/legends-george-best-on-ronaldos-man-united-debut/. अन्तिम पहुँच तिथि: 27 August 2014. ↑ "Man Utd stroll past Bolton". BBC Sport. 16 August 2003. http://news.bbc.co.uk/sport1/hi/football/eng_prem/3140899.stm. अन्तिम पहुँच तिथि: 27 August 2014. ↑ "Ferguson hails Ronaldo debut". BBC Sport. 17 August 2003. http://news.bbc.co.uk/sport1/hi/football/teams/m/man_utd/3157145.stm. अन्तिम पहुँच तिथि: 27 August 2014. ↑ Wilson, Paul (17 August 2003). "Only one Ronaldo as United find new idol". The Guardian (London). https://www.theguardian.com/football/2003/aug/17/match.sport5. अन्तिम पहुँच तिथि: 27 August 2014. ↑ "Man Utd see off Pompey". BBC Sport. 1 November 2003. http://news.bbc.co.uk/sport1/hi/football/eng_prem/3207091.stm. अन्तिम पहुँच तिथि: 27 August 2014. ↑ Weaver, Paul (22 March 2004). "United rediscover form and put Arsenal on red alert". The Guardian (London). https://www.theguardian.com/football/2004/mar/22/match.sport7. अन्तिम पहुँच तिथि: 27 August 2014. ↑ "Birmingham 1–2 Man Utd". BBC. 10 April 2004. http://news.bbc.co.uk/sport1/hi/football/eng_prem/3574333.stm. अन्तिम पहुँच तिथि: 27 August 2014. ↑ Ridley, Ian (15 May 2004). "Ronaldo's good and bad day". The Guardian (London). https://www.theguardian.com/football/2004/may/16/match.sport1. अन्तिम पहुँच तिथि: 27 August 2014. ↑ "Man Utd win FA Cup". BBC Sport. 22 May 2004. http://news.bbc.co.uk/sport1/hi/football/fa_cup/3725063.stm. अन्तिम पहुँच तिथि: 26 January 2011. ↑ "Man Utd 3–1 Aston Villa". BBC. 22 January 2005. http://news.bbc.co.uk/sport1/hi/football/eng_prem/4177033.stm. अन्तिम पहुँच तिथि: 27 August 2014. ↑ Marshall, Adam (22 January 2005). "Fergie: Ronaldo's best game". Sky Sports. http://www1.skysports.com/football/news/11667/2324559/fergie-ronaldos-best-game. अन्तिम पहुँच तिथि: 27 August 2014. ↑ "Arsenal 2–4 Man Utd". BBC. 1 February 2005. http://news.bbc.co.uk/sport1/hi/football/eng_prem/4221105.stm. अन्तिम पहुँच तिथि: 27 August 2014. ↑ McCarra, Kevin (2 February 2005). "United storm the battle of Highbury". The Guardian. https://www.theguardian.com/football/2005/feb/02/match.sport. अन्तिम पहुँच तिथि: 27 August 2014. ↑ McCarra, Kevin (20 January 2005). "Rooney ends Exeter dream". The Guardian. https://www.theguardian.com/football/2005/jan/20/match.manchesterunited. अन्तिम पहुँच तिथि: 27 August 2014. ↑ Wilson, Paul (20 February 2005). "Rooney return proves a distraction as Fortune steals in to seize chance". The Guardian. https://www.theguardian.com/football/2005/feb/20/match.sport8. अन्तिम पहुँच तिथि: 27 August 2014. ↑ Lawrence, Amy (13 March 2005). "Coastal breeze for United as Keane blows away resistance". The Guardian. https://www.theguardian.com/football/2005/mar/13/match.southampton. अन्तिम पहुँच तिथि: 27 August 2014. ↑ McCarra, Kevin (18 April 2005). "Ferguson's men triumph by a one-way street". The Guardian (London). https://www.theguardian.com/football/2005/apr/18/match.newcastleunited. अन्तिम पहुँच तिथि: 27 August 2014. ↑ "Arsenal 0-0 Man Utd (aet)". BBC Sport. 21 May 2005. http://news.bbc.co.uk/sport1/hi/football/fa_cup/4558271.stm. अन्तिम पहुँच तिथि: 19 October 2015. ↑ "Man Utd 4–1 Bolton". BBC. 31 December 2005. http://news.bbc.co.uk/sport1/hi/football/eng_prem/4560308.stm. अन्तिम पहुँच तिथि: 27 August 2014. ↑ Hodgson, Guy (5 February 2006). "Manchester Utd 4 Fulham 2: Ronaldo's double proves decisive as Fulham fume". The Independent (London). http://www.independent.co.uk/sport/football/premier-league/manchester-utd-4-fulham-2-ronaldos-double-proves-decisive-as-fulham-fume-343330.html. अन्तिम पहुँच तिथि: 27 August 2014. ↑ "Portsmouth 1–3 Man Utd". BBC. 11 February 2006. http://news.bbc.co.uk/sport1/hi/football/eng_prem/4680592.stm. अन्तिम पहुँच तिथि: 27 August 2014. ↑ "Middlesbrough 4–1 Man Utd". BBC Sport. 29 October 2005. http://news.bbc.co.uk/sport1/hi/football/eng_prem/4366686.stm. अन्तिम पहुँच तिथि: 1 February 2010. ↑ "Ronaldo extends Man Utd contract". BBC Sport. 18 November 2005. http://news.bbc.co.uk/sport1/hi/football/teams/m/man_utd/4448900.stm. अन्तिम पहुँच तिथि: 28 August 2014. ↑ "Man Utd ease to Carling Cup glory". BBC Sport. 26 February 2006. http://news.bbc.co.uk/sport1/hi/football/league_cup/4727118.stm. अन्तिम पहुँच तिथि: 26 January 2011. ↑ McCarra, Kevin (11 April 2007). "Seven wonders of sublime United dazzle and destroy helpless Roma". The Guardian (London). https://www.theguardian.com/football/2007/apr/11/match.sport. अन्तिम पहुँच तिथि: 27 August 2014. ↑ Winter, Henry (11 April 2007). "Seventh heaven in Theatre of Dreams". The Telegraph. http://www.telegraph.co.uk/sport/football/2310770/Seventh-heaven-in-Theatre-of-Dreams.html. अन्तिम पहुँच तिथि: 27 August 2014. ↑ Wilson, Paul (6 May 2007). "Misfiring Ronaldo gets a kick out of giving City the runaround". The Guardian (London). https://www.theguardian.com/football/2007/may/06/sport.comment4. अन्तिम पहुँच तिथि: 27 August 2014. ↑ "Ronaldo wins PFA double". World Soccer. 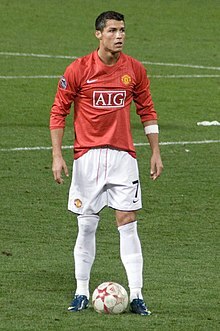 23 April 2007. http://www.worldsoccer.com/news/ronaldo-wins-pfa-double. अन्तिम पहुँच तिथि: 28 August 2014. ↑ Buckingham, Mark (4 May 2007). "Writers award for Ronaldo". Sky Sports. http://www1.skysports.com/football/news/11667/2455317/writers-award-for-ronaldo. अन्तिम पहुँच तिथि: 28 August 2014. ↑ "Ronaldo secures PFA awards double". BBC Sport. 22 April 2007. http://news.bbc.co.uk/sport1/hi/football/6582201.stm. अन्तिम पहुँच तिथि: 1 May 2007. ↑ Kay, Oliver (14 April 2007). "Ferguson lets rip at Madrid after Ronaldo signs £31m deal". The Times (London). http://www.timesonline.co.uk/tol/sport/football/premiership/manchester_united/article1652823.ece. अन्तिम पहुँच तिथि: 16 April 2007.